When I use my digital camera, I tend to take a lot of photos. After all, one of the beauties of going digital is that you don’t have to worry about wasting film on bad shots. When you get home, you just delete the ones you don’t want. Although you can import all your pictures into iPhoto and then remove the ones you don’t like, I find it easier to do my filtering first. In the past, I used the clever program PhotoReviewer, but that utility didn’t make the transition to Leopard. A good alternative is Photo Wrangler. Like PhotoReviewer, Photo Wrangler makes it easy to quickly scan through a folder of photos and sort them into separate folders. First you choose your source folder (where the to-be-sorted photos reside). Then you add destination folders; for example, Import and Leave. (Trash is always a destination; you don’t need to create a “Delete” folder.) Finally, you choose whether you want to move photos from the source folder to the destinations or copy the photos, leaving the originals in place. You aren’t limited to two folders; you can add as many as you like. For example, you could have destination folders based on events, people, or photo type (portraits, landscapes, and so on). Or you could “rate” photos by moving them into folders named 1, 2, 3, 4, and 5. 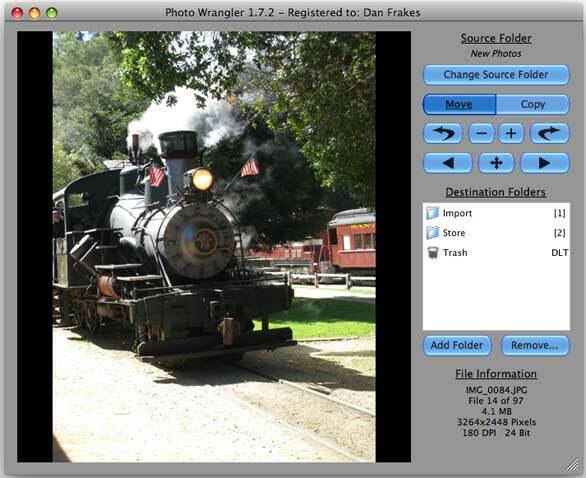 Photo Wrangler displays the source photos, one at a time, in its preview area. For each photo, you click on the appropriate action (folder name) in the Destination Folders list; in my example, Import or Leave. Photo Wrangler also automatically assigns a keyboard shortcut—1, 2, 3, and so on—to each folder you designate as a destination; you can instead use these keys to sort images. When you choose an action, Photo Wrangler immediately performs that action and moves on to the next image. While viewing a photo, buttons and keyboard shortcuts let you rotate or zoom the image or even rename it. (Unfortunately, Photo Wrangler doesn’t automatically rotate photos based on EXIF tags.) Or you can skip the image without taking any action. When necessary, Photo Wrangler can automatically rename images when the destination folder already contains an image with the same name. Photo Wrangler can also search for duplicate image files and display basic slide shows. Using this process, you can browse and sort a folder of images with minimal effort; as you become familiar with the keyboard shortcuts assigned to each destination folder, you’ll find yourself breezing through photos much faster than you could in iPhoto. And because you’re doing your filtering before importing into iPhoto, your iPhoto library and database won’t get bogged down by unused photos. On the other hand, Photo Wrangler doesn’t display photos as fast as PhotoReviewer did; there’s a brief pause as the program switches between images. And you can’t manually choose the order of destination folders or choose the keyboard shortcuts for each; folders are listed alphabetically and then assigned to consecutive number keys. (This is why I used the names Import and Store; Import would be assigned to the 1 key and Store—"don’t import"—to the 2 key.) This limitation also means that if you’re processing a bunch of photos and decide you need another destination folder, picking the wrong name could put that folder somewhere other than the end of your list, making you re-learn the keyboard shortcut for each folder.